Today we’re having some friends over for a potluck lunch date. Last potluck I brought a big crockpot of minestrone soup. It went a long way, longer then I anticipated. 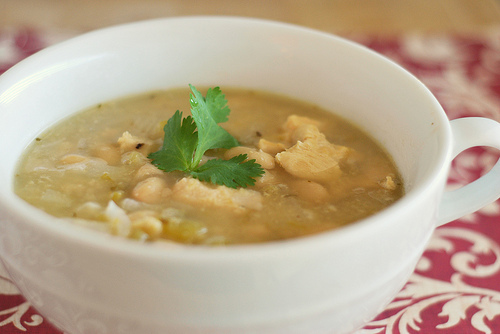 So, today I have decided to follow that up with another big pot, this time of white chicken chili. I soak my beans for at least 12 hours (up to 24) in raw apple cider and water. I then simmer them all day in a crockpot of nourishing, homemade chicken stock. I make lots of different kinds of beans and then bag up the extras to use as “fast food” for the rest of the week or so. This is my convenience way of getting out of using canned beans for meals. For this recipe I used lentil and azduki beans, but you could use any assortment of beans. I also used zucchini and celery, but you could throw in whatever vegetables you have on hand. Add about 2 tablespoons olive oil (or enough to coat the bottom of your pot) and onions, celery, and zucchini. Saute on a low heat for about 5-8 minutes. Add chicken stock and all other ingredients, except the cilantro and cream. Bring to gentle simmer and allow to heat through all ingredients, about 30 minutes or so. Add cream and fresh cilantro and keep soup on a low setting until ready to serve. Remember that the longer spicy foods sit, the hotter they become. Enjoy topped with sprouted corn chips, or topped with a bit of soured cream and fresh cilantro. I did let mine sit on low for about 2-3 hours before serving. This could easily be made in a crockpot and ready by dinner time. Just add all the ingredients together and put it on low for about 8 hours. Enjoy!